That coach at College World Series sounded as if he was a narrating a special on Canadian breed of animal, not an otter or a beaver, he was discussing Canada and its Seawolves. Maxx Tissenbaum (Toronto), Jasvir Rakkar (Brampton), Tanner Nivins (Kitchener) and Cole Peragine (Belle Ewart). “I made a connection there with a gentleman named Dan Thompson, who is an outstanding baseball person. He had his team on Long Island and he took a liking to what our program was doing. We started recruiting his players, and true to his word, and true to form, those guys were excellent players, excellent students and excellent young men. Senk saw Tissenbaum wearing a Toronto Mets uniform at the Ontario Cup and Tissenbaum became his second baseman and clean-up hitter. He recruited right fielder Nivins, shortstop Peragine and reliever Rakkar to Stony Brook from Thompson’s Ontario Terriers. The Seawolves became the Cinderella story of college ball with four Canadians playing starring roles. When it came time for the voting electorate to select the 13th annual Canadian Baseball Network all-Canadian college team there were Seawolves aplenty. And Tissenbaum was top dawg, er Seawolve and top Canadian. With more first-place votes -- 40 of the 58 ballots -- than anyone else to win Canadian Baseball Network Player of the Year honours, the best of the 745 Canadians playing south of the border. Tissenbaum also earned All-Canadian First Team honours at second base on our 13th annual college team playing south of the border. He was one first-place votes ahead of Sean Bignall and three up on Jackson Gooch. Teammates Nivins and Peragine were named to the CBN Second Team, while Rakkar earned Third Team honours. 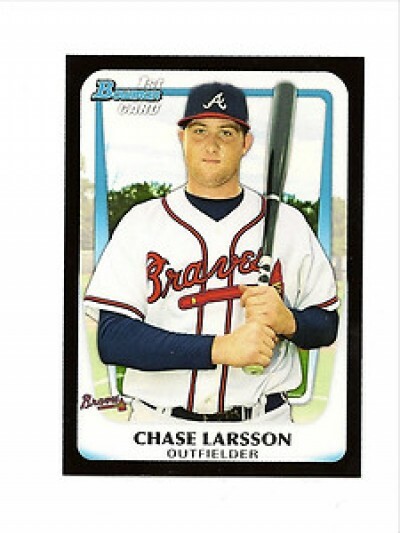 _ OF Chase Larsson (Vancouver, BC), Cameron Aggies in 2011. _ OF Marcus Knecht (North York, Ont.) Connors State College Cowboys in 2010. _ 3B Jesse Sawyer (Calgary, Alta.) of the South Dakota State Jackrabbits in 2009. _ DH Mike Gosse (Pitt Meadows, BC), of the Oklahoma Sooners in 2008. _ 1B Kevin Atkinson (Surrey, BC), of the New Mexico Jr. College Thunderbirds in 2007. _ OF Jon Baksh (Mississauga, Ont. ), of the Florida Tech Panthers in 2006. _ 1B Karl Amonite (Woodslee, Ont. ), of the Auburn Tigers in 2005. _ OF Charlie MacFarlane (Lantzville, BC), of the Cumberland Bulldogs in 2004. 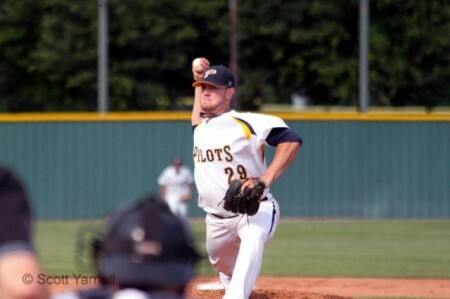 _ C Aaron McRae (Delta, BC), of the LSU-Shreveport Pilots in 2003. _ OF Ryan Kenning (North Vancouver, BC), of the New Mexico State Aggies and RP-SS Jesse Crain (Toronto, Ont. ), of the Houston Cougars, who shared honours in 2002. 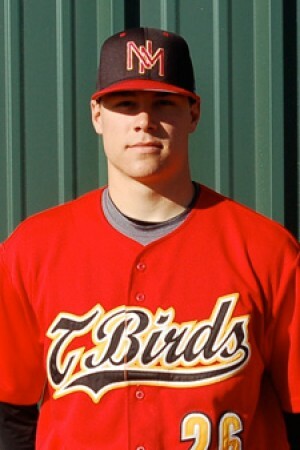 _ LHP Jeff Francis (North Delta, BC), of the British Columbia Thunderbirds in 2001. _ And OF Ben Emond (Farnham, Que. ), of the Texas Longhorns, in 2000, our inaugural year. Our voters included 18 coaches, from colleges and elite programs, 14 scouts, 10 of our CBN writers, nine suits (executive, GMs, front-office staff), three other writers, two voters from the broadcast booth and two former players. Our electorate came from seven different provinces and eight states. Voting was done on a 5-3-1 basis and as usual if you failed to turn in your ballot you have lost your right to complain. Tissenbaum, the fifth Canadian selected in the June draft, went to the San Diego Padres in the 11th round. He hit .390 amassing 94 hits, including 20 doubles, a triple and three homers. He knocked in 51 runs, scoring 44. He had a .519 slugging mark and a .453 on-base average for a .972 OPS. _ Tissenbaum hit a two-run double in the first inning as Stony Brook beat the Maine Black Bears 14-6. He also had three hits, including two doubles. Peragine singled in a run and Nivins singled. _ Tissenbaum went 3-for-3 with two RBIs in a 13-6 win over Maine to win the America East. Nivins added three hits while Peragine singled and drove in a run. Stoney Brook headed for the Coral Gables Regional at Alex Rodriguez Field in Miami. The Seawolves were the fourth seed facing the likes of the Miami Hurricanes, the Central Florida Bulls and Missouri State Bear. The regional was statistically the toughest in the nation with an average RPI of 38.75. _ Tissenbaum had three hits and three RBIs as Stony Brook laid a 10-2 beating on Miami 10-2, making their record 40th straight Regional appearance laying a 10-2 beating on the Hurricanes. Tissenbaum had a two-run single in the fifth which broke a 2-2 tie. Peragine singled to knock in a run. Rakkar worked a scoreless 1-2-3 ninth, striking out one. 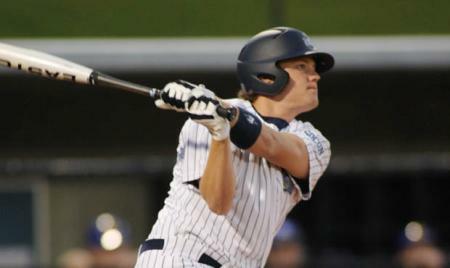 _ Peragine had two hits while Tissenbaum drove in a run in a 9-8 loss to Central Florida. _ Peragine had two hits and Tissenbaum one in a 10-7 loss to Central Florida. _ Rakkar came out of the bullpen to make his third start pitching six innings in a 12-5 win over UCF. He allowed four earned runs on seven hits in six innings. Tissenbaum doubled, singled and drove in a pair of runs, while Nivins singled in a pair of runs and Peragine singled. _ Peragine singled and knocked in a run in a 10-7 over Missouri State and Tissenbaum drove in a run. _ Tissenbaum had two hits as No. 16 Stony Brook lost 5-4 in 12 innings to No. 1 ranked LSU Tigers in the opener of the best-of-three series, a game played over two days due to rain. Rakkar allowed one run in the 10th in his one inning of work. I was in Atlanta at the time and both clubhouses were screaming at the TV cheering for their respective faves. Brett Lawrie was rooting for former teammate Tissenbaum and Stony Brook. _ Then the Seawolves won 3-1 to even the series. _ And Tissenbaum doubled twice knocking in three runs and Peragine singled as the Seawolves won 7-2 -- and Shock The World -- before 11,976 fans to advance. _ Tissenbaum had two hits in a 9-1 loss to the UCLA Bruins at Omaha. Rakkar worked 4 1/3 innings allowing one run on three hits and two walks. _ Tissenbaum and Nivins each singled as the Florida State Gators scored a 12-2 win, eliminating the Seawolves finishing the season 52-15. Our first-team features seven players from Ontario, two each from Alberta, British Columbia and Saskatchewan, plus one from Quebec. Our first, second and third teams combined, with ties, include 23 players from Ontario and nine from B.C. The rest of the representation came from Alberta (six), Quebec (two) and Saskatchewan (two). Including the first three teams and the honourable mentions the Ontario leads the way with 78 players named. British Columbia is next with 24, followed by Alberta (13), Quebec (11), Saskatchewan (seven), Manitoba (two) and Nova Scotia (one). Lefthanders (tie): David Otterman (Coquitlam, BC), UBC and Keegan Hucul (St. Albert, Alta.) Seward County. Otterman’s best start of the year was when he pitched eight scoreless against the Concordia Cavaliers in Portland, before UBC scored a pair in the 10th for a 2-0 win. He allowed one hit striking out nine over eight innings of work. Facing the Lewis-Clark State Warriors he held them off the board with allowing five hits in eight innings, but took the tough loss as the Warriors rallied with two out in the ninth. He allowed two runs on eight hits and one walk in 8 1/3 innings as he fanned eight. Otterman went 5-3 with a 2.57 ERA in 13 games for the coach Terry McKaig’s Thunderbirds. After surrendering a home run in his first game, Otterman did not allow another all season. He gave up 51 hits in 77 innings and opponents hit .192 against him leading the entire conference, ranking 18th best in the NAIA. He started 12 games. In his three seasons at UBC, Otterman started 20 games and appeared in 15 others as a reliever. His record is 8-7 with a 2.86 ERA. The lefty earned All-NAIA West Team honours. Otterman, who pitched for the Coquitlam Reds and coach Bill Green, was drafted by the Milwaukee Brewers in the seventh round. Hucul pitched a 7-2 win over the Colby Trojans, insuring the Saints of hosting a Sub-Regional as the top seed for the Region VI tournament. After allowing a solo home run to 26-year-old first baseman Brandon Wilson to make it 1-0, Hucul was in control striking out the side in the fourth, going the distance, retiring the Trojans on nine pitches in the seventh to secure the 7-2 victory. For Hucul it was his ninth win, as he allowed six hits and two runs while striking out seven. He allowed three hits and two runs while fanning six in a complete game 9-2 win over the Barton Cougars. The Saints No. 1 starter throughout the season earned a second team Jayhawk West All-Conference honours after finishing the year 9-2 with a 2.99 ERA in 81 1/3 innings. The sophomore lefty held opponents’ to a .209 batting average and paced the club with 62 strikeouts. Hucul’s nine wins tied with Clarendon’s Sam Oulette, three behind Jared Mortenson. Hucul pitched for St. Albert for coaches Rob Boik and Cam Houston. Mortensen acted like the ace he was, pitching the opener of the NAIA national championship guiding the no. 1 Pilots past the No. 11 Lindsey Wilson Blue Raiders 1-0 at Brooks Stadium-Doc Hideg Field in Paduch, Ky. It was his sixth time this year he has gone the distance, needing 123 pitches striking out 10 for a four-hit shutout. He retired 15 in a row in a game which took 105 minutes. Earlier he won Pitcher of the Week honors tossing a complete game, two-hit 7-0 shutout over Texas College. In eight innings, he struck out 11 and walked three. He earned Conference Pitcher of the Year honours and was a repeat winner being named to the Red River Athletic All-Conference Team as he was a year ago. He was also one of four pitchers named to the All-Louisiana team in voting conducted by various state sportswriters and school sports information directors. He was the only NAIA player joining the likes of LSU’s Kevin Gausman, Southeastern Louisiana’s Stefan Lopez and Tulane’s D.J. Ponder. He finished with a 12-3 mark and a 1.67 ERA in 17 games, making 15 starts. Mortenson had the lowest ERA amongst qualifiers (more than 50 innings) followed by Paul Barton of the Panola Ponies, 1.80 and Tim Black,North Iowa Trojans, 1.88. And Mortenson also led in wins, three more than Marshalltown's Keegan Hucul and Clarendon’s Sam Oulette. Mortenson pitched for Abbotsford Cardinals and coach Andy Rempel. Jon Fitzsimmons (London, Ont. ), Canisius. Fitzsimmons had 11 saves and was 3-2 with a 1.42 ERA in 25 appearances. The 6-foot-2 righthander averaged 12.08 strikeouts per nine innings. He broke the program’s single-season and career records for saves and now ranks 26th nationally in the category and is tied for fourth all-time in MAAC single-season history. In MAAC play, he did not allow a hit or a run in nine appearances (8.2 innings). He held opposing hitting to a .182 average. Fitzsimmons earned Metro Atlantic Athletic Conference Relief Pitcher of the Year, the first in program history to win the award which began in 2004. Fitzsimmons’s 11 saves shared the lead amongst Canadians playing college south of the border. Wayne State’s Bobby Hurley also had 11, three more than Dickinson State’s Andrew Grafton and Concordia-Ann Arboour’s Ryan Noack. He shared for the lead amongst Canadians with Wayne State’s Billy Hurley with 11 each. Catchers (tie): Larry Balkwill (Chatham, Ont. ), Siena and Tyler Patzalek (Burlington, Ont.) Maine. Balkwill hit .313 in MAAC games and posted a .475 slugging percentage and held a 3.41 GPA as a history major entering the spring semester. He was the co-recipient of the Leo Dufort Student Athlete of the Month Awards. The Leo Dufort award is presented nine times annually throughout the academic year, recognizing exemplary achievements in both academics and athletics. The late Leo Dufort received a B.S. in marketing and management from Siena in 1977. His entire academic career was completed on a part-time basis beginning in the spring of 1961, as a married adult at the same time raising five children. He passed away of a heart attack while cross country skiing in February of 1993. His wife Jeanine wanted to immortalize his memory. The original plaque was donated and the department began the award to carry out his legacy. Dufort was a Navy Veteran (USS Bennington). He hit .281 for the Saints, and led the team with six home runs and 29 RBIs, 10 doubles, a .381 on-base percentage, a .449 slugging percentage and a .830 OPS. Balkwill played for coach Richard Solomon with the Windsor Selects and Windsor coach Al Bernachi at the junior nationals. Patzalek played a large role as the Black Bears exploded for 76 runs in a series sweep of UMBC Retrievers, including setting a school and America East record, scoring 32 runs in the second game of a doubleheader. 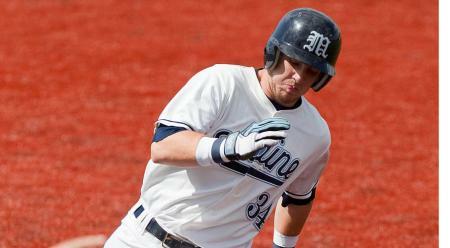 In Maine’s 32-14 win over the Retrievers, Patzalek went 3-for-6 with five runs scored and six RBIs. He had three doubles and three home runs, finishing the weekend against UMBC with a .538 on-base percentage and a 1.043 slugging percentage. Patzalek hit .522 (12-for-23) with eight runs scored and a team-best 15 RBIs. He played in 44 games for the Black Bears mainly behind the plate. He hit .286 with 31 runs scored and 35 RBIs. He has seven doubles to go along with three home runs. He struck out 12 times in 192 plate appearances and had a .746 OPS. Patzalek earned America East Second Team honours and earned America East Player of the Week honours. At home Patzalek played for Danny Thompson’s Ontario Terriers and the Burlington Bulls, coached by his father Tony Patzalek. First base: Greg Friesen (Regina, Sask.) LSU-Shreveport. Friesen drove in five as the Pilots won three games against ranked teams. He was 2-for-3 with a homer and three RBIs in an 11-2 win over No. 21 Southern Poly (Ga.), scored twice as LSUS defeated No. 7-ranked Cumberland and had four hits, including a pair of doubles, to pound no. 15 Belhaven 11-3. For the week, Friesen was 7-for-11 with four runs scored and four walks. He hit .388 for the season with 12 homers, 13 doubles and 50 RBIs. He had a .708 slugging mark, a .494 on-base mark and an amazing 1.202 OPS. Friesen was selected as the state’s Newcomer of the Year by the Louisiana Sports Writers Association in voting conducted by state sportswriters and school sports information directors. He earned first team All-RRAC honors after he helped guide the Pilots to a third place finish in the NAIA College World Series. He also earned the Red River Athletic Conference Player of the Week award. Friesen played Mark Dolan and Dave Peters with the Regina Rangers and coach Barry Erickson with the Regina White Sox. Tissenbaum, whose grandpa had season's tickets at the SkyDome and therefore young Maxx was often featured on the Jumbotron (like here in 1995) between innings, hit .429 (6-for-14) in season-opening round robin tourney at Nicholls State, had six hits in three-game set at East Carolina, hit .421 (8-for-19) at the Dairy Queen Classic in Minneapolis, had a double, triple and home run against Yale, went 3-for-5 with three RBIs, including two-run home run in victory over Columbia and drove in two runs in back-to-back games against. 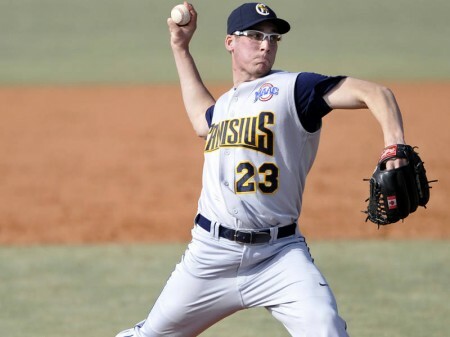 Tissenbaum earned ABCA third team All-American honours, was named to Coral Gables Regional All-tournament team, selected to All-America East first team, was named Louisville Slugger preseason third team All-American by Collegiate Baseball Newspaper and earned America East Player of the Week. He was selected by the San Diego Padres in 11th round. Tissenbaum played for the Toronto Mets and coach Jason Chee-Aloy and earned 2011 Canadian Baseball Network First Team honours. Third base: Andrew Firth (London, Ont.) British Columbia. Firth had three hits in a 12-5 win against Corban at the conference tourney. He also had three hits and knocked in a pair of runs in a 7-2 win over the Patten Lions and earlier in the series went 5-for-5, including a homer, with four RBIs in a 10-7 win over Patten. He started all 47 games with the Thunderbirds spending some time at second. He had an average of .360 with four home runs and 50 RBIs, powering a team that was devastated by injuries. He led the team in hits (71), 12 doubles (tied) and RBIs. Firth had a .482 slugging percentage, a .419 on-base percentage and a .901 OPS. Firth was named to the All-NAIA West All-Star team and was honoured as Daktronics-NAIA Scholar athletes. Firth, who played for the London Badgers and Mike Lumley, earned 2010 Canadian Baseball Network Honourable Mention. Shortstop: Pier-Olivier Dostaler (Mont-Carmel, Que. ), Lamar. Dostaler had a pair of hits as the Runnin’ Lopes beat Northern Colorado 11-3 and in the nitecap, a 12-3 win, he was 4-for-5, including a double and a homer, as he knocked in two runs. Dostaler set a school record with the most hits in a season collecting 100 and set the school record for triples with seven. He also set a school record with 179 hits in his career. He hit .442, 20th best hitter in NCJAA Division I, with 20 doubles and a .490 on-base percentage. His numbers were good enough to earn him the National Junior College-Rawlings Big Stick Award in Western District. He was also named a second-team NJCAA All-American. Even more impressive is the fact that his conference was an all-wood bat conference. He has committed to Missouri Baptist. Dostaler led all Canadians with 100 hits, six more than Stony Brook’s Maxx Tissenbaum. Dostaler played for Eagles Plante Sports Trois-Rivieres and coach Rémi Doucet, earned 2011 Canadian Baseball Network Second Team honours. Outfielders: Shawn Bignall (Brampton, Ont. ), Arkansas Little Rock, Jackson Gooch (Delta, BC), Lamar and Tyler Hollick (Calgary, Alta. ), Chandler-Gilbert. Bignall had a record-setting performance in a 20-8 victory over South Dakota state going 4-for-5 with three home runs, a double, six RBIs. He set a UALR record with 14 total bases in the game with his three home runs also tying the school record. For the week he had three multi-hit games, hitting .375 (9-for-24) with 12 RBIs, plus two doubles, a triple and three home runs to help UALR to a 4-1 record. Over the five games he had a .917 slugging percentage and .400 OBA. The week before he led the Trojans to a three-game sweep at UT Martin Skyhawks with three home runs, 12 RBIs and hitting .667 in the series. His 10-inning solo shot proved to be the game winner in the Trojans’ 12-11 victory in the series finale. At the end of the 2012 regular season, Bignall ranked fourth in the nation in home runs (18), fifth in slugging percentage (.696), fifth in total bases (149) and sixth in RBIs (64). His season totals for home runs and total bases were new school records for Arkansas-Little Rock, and he became the first player in school history to score 60 runs and pile up 60 RBIs. He was named to the Golden Spikes Watch list (for College Player of the Year) a First Team All-Sun Belt Conference selection and was named Sun Belt Player of the Week in back-to-back weeks during the season, the first player since 2009 to do so. Bignall shared the lead for most homers by Canadians with Lamar’s Jackson Gooch. Bignall, who played for Murray Marshall with Team Ontario and his father Mike Bignall with the Brampton Royals, earned Canadian Baseball Network First Team Honour in 2010 and a Second Team in 2009. Gooch was 4-for-4 with an RBI in a 15-3 Lamar Running Lopes win over the Frank Phillips Plainsmen. He had no less than 11 three-hit games: including two doubles and three RBIs in a 6-0 win over Western Nebraska, one double and two RBIs in a 15-5 triumph against Miles, two homers and four RBIs in a 10-0 romp over Frank Phillips, a double and a solo homer in a 9-7 win over Frank Phillips, an two-run homer in a 12-3 win against Northern Colorado, a double and three RBIs in an 8-4 loss to Otero, a double and a home run in a 16-10 loss to Otero, a three-run homer in a 15-6 over Trinidad State, a homer and three RBIs in a 9-1 win over McCook, two homers and three RBIs in a 9-5 win against Trinidad State and a double in a 6-4 loss to Salt Lake. Gooch hit .415 with 90 hits in 145 at bats, as well as 13 doubles, two triples, 11 home runs, 35 runs, 48 RBIs. He earned first team All-Region IX honors and was the nation’s RBI leader among JUCO teams with 78 and led the region with 18 homers guiding Lamar to a league and regional championship. Gooch led all Canadians in RBIs, four more than LSU-Shreveport’s Greg Friesen. Gooch and Arkansas-Little Rock’s Sean Bignall shared for the home run lead with 18 apiece. Gooch played for the White Rock Tritons and coach Josh Ridgway. Hollick led the DII ranks in on-base percentage (.605), ranked third in batting average (.475) and second in stolen bases (61). In addition, he stole 61 bases in 67 attempts (91%), which ranked second nationally, as did his 53 walks. He had signed a letter of intent to finish his academic and collegiate baseball career at Ohio State University, but was drafted in the 14th round (448th overall selection) of this year’s draft by the San Francisco Giants and chose to sign. He was named Division II Player of the Year by the National Junior College Athletic Association, a first for the CGCC Coyotes, American Coaches Association Player of the Year, Region Player of the Year and Division II First Team All-American, First Team All Region and First Team All Conference. 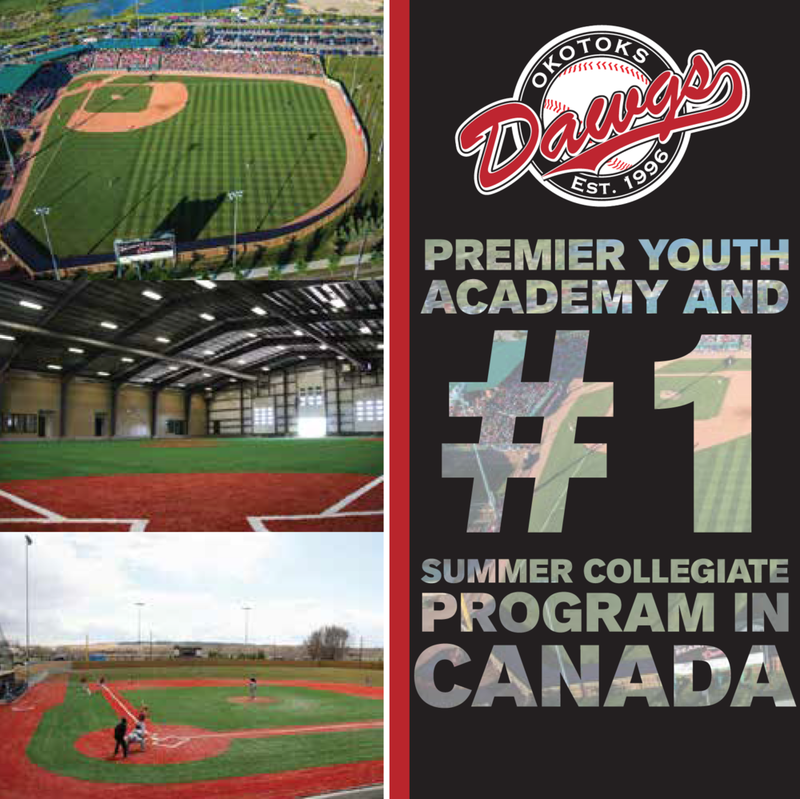 Hollick played for coaches Vince Ircandia and Frank Ingram with the Okotoks Dawgs. DH: Trevor Edwards (Toronto, Ont.) North Carolina-Greensboro Spartans. Edwards singled in the tying run in the bottom of the seventh in a 4-3 come-from-behind win over the Duke Blue Devils, went 5-for-6 with three RBI including a no-doubt home run in an 8-4 win over No. 10 North Carolina Tar Heels and hit a two-run homer in a 6-3 win over the Princeton Tigers. Edwards launched his 12th home run in dramatic fashion to help UNCG complete a come-from-behind rally in the bottom of the ninth to send the game into extras, where UNCG would win game one, 7-6 over Presbyterian, he knocked in three runs in a 10-8 win over Charleston and hit two home runs in a 5-1 win over Western Carolina. Edwards shattered his career-mark for homers, with 14 in 51 contests, good enough to keep him among the national leaders in the category. His slugging percentage is (.599) and walked 23 times. He hit .289 in with 12 doubles, two triples and 35 RBIs. He earned and pre-season Southern Conference honours. Edwards, who played for the Toronto Mets and coach Jason Chee-Aloy, is the only repeat First Team member, besides Tissenbaum, having earned Canadian Baseball Network First Team honours in 2011 behind the plate. Left handers: Rob Zastryzny (Edmonton, Alta. ), Missouri. Zastryzny, the Tigers’ top arm all season long, had a 3.80 ERA in 17 starts, working 109 innings. He fanned 76 and walked 31 while going 5-5 in his sophomore season as he was again the Tigers’ Friday night starter. He struck out a career-best 12 in a dominating start against Oklahoma State, helping the Tigers to a 2-1 win over the Cowboys, allowing one earned run. gave up five hits and an earned run while striking out six in a 13-4 win over Kansas State. He blanked Texas in the Big 12 tournament opener, allowing five hits over 8 1/3 innings, in a 5-0 win and pitched an NCAA Regional win over New Mexico State, allowing two earned runs striking out five over six innings in a 6-2 win over the Aggies. He earned Big 12 Pitcher of the Week honours after pitching a complete game shutout of the Texas Tech Red Raiders, striking out five and allowing seven hits on 112 pitches. He was the first Tiger since Kyle Gibson to throw a complete-game shutout in conference play in 2009. Van Spronsen threw a second-straight complete game, striking out a career-high nine as his Seahawks beat Long Island 2-1. And he was getting stronger as the game ended, retiring the final 10 in order, including striking out the side in the ninth. He turned in complete games in five of six starts while going at least eight in his last seven starts. He went through a stretch where pitched 44 out of a possible 46 innings on the mound as he pitched the Green & White to four wins in five conference games. Earlier, he blanked Quinnipiac Bobcats 1-0. Van Spronsen struck out five scattering 10 hits and three walks -- it helped when Van Spronsen picked a runner off second -- and he limited QU to a 1-for-8 with runners in scoring position, The lone hit coming on a grounder that hit a Bobcat attempting to advance to third. Van Spronsen was 8-1 with a 2.07 ERA walking 23 and fanning 65 in 100 innings. He pitched for the Brantford Braves and coach Jeff Amos. Janisse had a year to remember. He was on the mound with the bases loaded in the top of the ninth the Alpine Bank Junior College World Series with the score tied when he was called for a balk by plate ump Pancho Flores in Grand Junction, Col. San Jac entered the ninth with a 5-4 lead with a 6-5 lead over the Iowa Western Reivers. A lead-off walk, a bunt single, a sacrifice bunt and a single tied the game. Janisse then took over and recorded a strike but walked the next hitter loading the bases. With two out, bases loaded. Janisse began his delivery and was immediately called for a balk. San Jac, ranked No. 17 in the country, No. 7 seed into the 10-team tournament, won the Region XIV championship to reach Colorado. In 40 1/3 innings, Janisse was 2-3 with three saves while allowing 30 hits and three earned runs for an impressive 0.67 earned-run average. He walked 12 batters and struck out 36. Janisse pitched for Richard Soloman and Joe Siddall’s Windsor Selects. 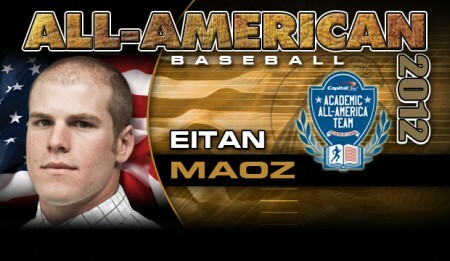 Catcher: Eitan Maoz (Ottawa, Ont.) North Carolina-Pembroke. Maoz played in 38 games (37 starts) for UNCP despite missing 2 1/2 weeks late in the season with a broken ankle. He still managed a .345 (48-for-139) average with 10 extra-base hits (three homers), 32 RBIs and 28 runs scored. He had a .464 slugging percentage and a .421 on-base percentage, for a .885 OPS. Maoz was 8-for-10 stealing bases and was a defensive stalwart, with a .984 fielding percentage. He earned Peach Belt Conference Capitol One Academic All-Americans All-Academic Team honours. He maintained a 3.87 GPA as an exercise & sports science major. Maoz played for Don Campbell’s Ottawa-Nepean Canadians program. Marion hit his 12th homer going 2-for-3 in an 8-3 loss to the Northeastern Plainsmen. Marion knocked down some fences hitting .434 with 12 home runs, 50 RBIs, 22 doubles and 54 runs scored. Marion led the nation with 21 doubles, and was in the top 30 in homeruns, hits, runs and RBIs. He earned Region IX First Team All Region honors as both a freshman and as a sophomore. Marion, who played for coach Shuan Connor and the Red Deer Stags and coach Les McTavish and the Vauxhall Jets Academy, earned 2011 Canadian Baseball Network Honourable Mention. Second base: Scott Jones (Victoria, BC), Colby. Jones had three hits and knocked in a run in a 16-15 win over the Otero Rattlers. Jones homered, doubled and knocked in five runs in a 17-1 win over the Pratt Beavers. Jones had two hits in a 5-5 tie against the Fort Hays Tigers. Jones doubled, singled and knocked in a run in a 10-0 win over Western Nebraska. Jones doubled in a run in an 8-5 victory over the Dodge City Conquistadors. He hit .358 with 58 hits, including 15 doubles, three triples and eight homers. He knocked in 37 runs with a .636 slugging mark, a .465 on-base average and a 1.001 OPS. Jones transferred to the University of British Columbia. He earned Kansas Jayhawk Conference (KJCCC) All-Conference First Team honours. Jones, who played for the Victoria Mariners and coach Mike Chewpoy, has earned 2011 Canadian Baseball Network Honourable Mention. Calbick belted a three-run home run over the right field fence, his fourth, to lead Maine to a 10-3 win over Bates finishing with four RBIs. Calbick knocked in four runs with a two-run single and two ground ball outs as Maine beat the Florida A&M Rattlers 17-7. Calbick singled in a run in a America East conference tourney win 5-1 win over Binghamton and singled in a 13-6 loss to Stoney Brook. He hit .287 in 56 games with 18 doubles, five homers and 43 RBIs. He had a .445 slugging mark, a .356 on-base percentage and an .801 OPS. He earned pre-season All-Conference America East honours. Calbick, who played for played for Bill Green’s Coquitlam Reds, earned 2011 Canadian Baseball Network Honourable Mention. Peragine had a hit and two RBI against Nicholls State, went 2-for-2 with two RBIs at Fairleigh Dickinson, drove in go-ahead run in 11th inning in 2-1 win over Yale, was 2-for-3 in second game of the Yale doubleheader, had a season-high four hits to go along with three RBIs at Fordham, drove in two runs in back-to-back games against Iona and Marist and had season-high four RBIs against Rhode Island. He hit .304 in 66 games with 11 doubles, six triples and 39 RBIs. He had a .797 OPS. Peragine earned Louisville Slugger Freshman All-American honours as well as NCWBA second team freshman All-American, America East Rookie of the Year and All-America East Second Team honours. He played for the Ontario Terriers and coaches Scott Van de Valk, Danny Thompson, Mike Tough and John McEwan. Outfielders (tie) Blake Carruthers (Calgary, Alta. ), British Columbia, Austin Russell (Victoria, BC), Colby, Tanner Nivins (Kitchener, Ont. ), Stoney Brook, Byron Reichstein (St. Thomas, Ont.) Texarkana. Carruthers knocked in five runs as No. 2-seeded UBC Thunderbirds baseball team defeated No. 4-seed Corban at the NAIA West Tournament, after a rain delay of almost four hours. Carruthers doubled to right knocking in two in the second and hit a three-run homer over the left-centre fence in the a six-run seventh. Carruthers homered, knocking in three runs in a 7-3 win over Master’s College. He hit .356 in 37 games, missing some time to injury, with 11 doubles, five homers and 39 RBIs, with .976 OPS. Carruthers was honoured as Daktronics-NAIA Scholar athletes. Carruthers played for the Calgary Dodgers under Brian Hanes, Canadian Baseball Network Third Team Honours in 2011. Russell went 4-for-6 with three doubles and five RBIs as Colby scored a 16-15 win over the Otero Rattlers. Russell had three hits, including a double and knocked in four as the Colby Trojans beat the Seward Saints 13-8. He had two hits in a 5-5 tie against the Fort Hays Tigers. Russell had three hits knocking in a run in a 17-1 win over the Pratt Beavers. Russell had a pair of hits in a 10-0 win over Western Nebraska and Russell three hits, knocking in a run in an 8-5 win over the Dodge City Conquistadors. He was a unanimous selection to the Kansas Jayhawk Conference (KJCCC) All-Conference First Team honours. Russell, who played for the Victoria Mariners and coach Mike Chewpoy, earned Canadian Baseball Network Third Team honours in 2011. Nivins was 3-for-5 with two doubles at Yale, 2-for-3 with two RBIs at Columbia, had two hits in four at-bats at Holy Cross, went 4-for-7 with two RBI and three runs scored in three-game series against Binghamton, had three hits and two RBIs at Albany, recorded two hits in back-to-back games against Hartford, had three hits in five at-bats against Fairfield, went 4-for-5 with three RBIs in series finale against UMBC. He hit .306 in 62 games with 11 doubles, three triples, two homers and 34 RBIs. He had a .417 slugging percentage, a .377 on-base mark and a .794 OPS. Nivins earned First Team America East honours. Nivins, who played for the Ontario Terriers and coach Danny Thompson, earned Canadian Baseball Network Honourable Mentions in 2011 and 2010. Reichstein led the Bulldogs in eight offensive categories last season, including doubles (14), home runs (five), runs scored (40), RBIs (38), batting average (.372), on-base percentage (.480), slugging percentage (.581) and OPS (1.062). He transferred to Navarro College after Texarkana, birth place of Hall of Famer Eddie Mathews (512 home runs) cancelled its program, as well as softball and golf. His 55 total hits were third on the team going into regionals, where the Bulldogs were eventually eliminated 2-1 by defending national champion Navarro. He was Region 14 East Conference player of the year and earned All-Region XIV honours. Reichstein played for coach Mike Lumley's London Badgers. DH: Ricky Alvernaz (Victoria, BC) Mayville State. Alvernaz had five three-hit games for the Comets: with a double and an RBI in a 6-0 win over Dakota State, had two doubles and an RBI in a 5-4 loss to North Dakota State, double in a 12-5 loss to Valley City State and homered, driving in three runs in a 7-6 loss to the Dickinson State Blue Hens. 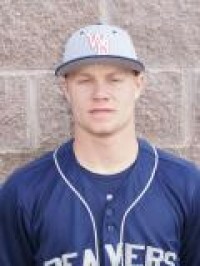 He also hit a grand slam in a 10-9 win over the Jamestown Jimmies and he homered, knocking in three runs in a 14-4 win against Dickinson. Alvernaz homered as No. 3 seed Mayville State defeating No. 6 seed Dakota State 13-0 in the Association of Independent Institutions (A.I.I.) Tournament. He finished the season with a .372 average in 42 games, led the team in hits with 54 and RBIs with 43. He had 11 doubles, two triples and three homers, while compiling a .970 OPS. He earned Dakota Athletic Conference First Team All-Conference honours. 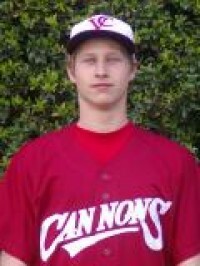 Alvernaz, who played for the White Rock Tritons coach Josh Ridgway, earned 2011 Canadian Baseball Network Honourable Mention. Lawrence walked only 13 and struck out 64 in 60 2/3 innings, compiling a 2.67 ERA to go with an 8-3 record. Lawrence earned Second Team All-Maryland JUCO honours. Before heading south he pitched for the Tecumseh Thunder and coach Dave Cooper. 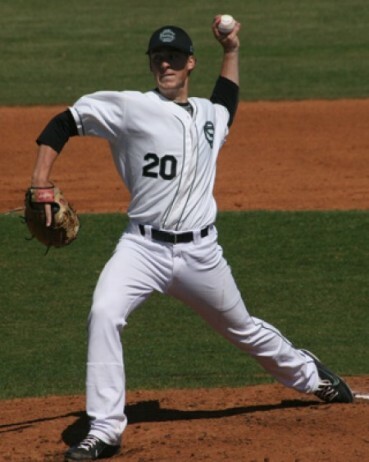 Right-hander: Mike Ellis (Surrey, BC) Florida International. Ellis picked up three wins pitching the Panthers to victory over Middle Tennessee State Blue Raiders -- seven innings, four earned runs, six strikeouts; the South Alabama Jaguars -- seven innings, seven hits, two runs, four strikeouts; and the Brown Bears -- five innings, six hits, three runs and four strikeouts. He pitched 6 1/3 innings allowing one run and fanning eight in a no decision against the Florida Atlantic Owls. He made 15 appearances -- 14 starts -- walking 45 and striking out 88 in 83 1/3 innings. He finished 3-2 record and a 3.13 ERA. Ellis pitched for the Langley Blaze and coach Doug Mathieson. Reliever: Jarvis Rakkar (Brampton, Ont. ), Stony Brook. Rakkar made 20 appearances, including three starts. He started at the Coral Gables Regional, pitching six innings in the 12-5 win over Central Florida Bulls. Stoney Brook beat the Miami Hurricanes 10-2 in the opener, lost 9-8 to Central Florida, beat Missouri State 9-7 and an hour later Rakkar took the mound at Alex Rodriguez Field in Miami, working six innings allowing four earned runs on seven hits and three walks. He struck out six. Then, Stony Brook won 10-7 to reach Baton Rouge. He was 6-2 with a 3.68 ERA in 20 appearances. He walked 20 and struck out 41 in 51 1/3 innings. Rakkar struck out four in two scoreless innings at Nicholls State for the save, worked 3 2/3 innings of relief at East Carolina, allowed two hits in four scoreless at Minnesota, struck out career-high six in seven scoreless against Yale, struck out two in a scoreless to earn the save at Columbia and tossed two scoreless against Hartford. Rakkar was named to the America East All-Academic team for a second year as a business management major. The Chicago Cubs took Rakkar in the 26th round. Rakkar pitched for Danny Thompson and the Ontario Terriers as well as Mel Oswald’s Canadian Thunderbirds. Robinson singled in a 13-6 by the USC Lake Sumter Fire Ants to be eliminated from the Region X Tournament. Louisburg finished with a 52-9 record. Robinson had two hits in the opener, a 5-4 loss to Pitt, he had a hit and drove in a run in a 10-2 win against the Guilford Tech Titans, he had three hits and two RBIs in an 8-3 win against Pitt. Robinson had a game-winning, bases-loaded single in the nitecap of a doubleheader against Guillford Tech in a 3-2 win. Robinson had a two-out RBI for the Canes in a 6-0 win. Robinson knocked in a run in a 4-3 win against USC-Sumter. Robinson played for Team Ontario and coach Murray Marshall. Sanders, a two year starter for the Hawks, posted a .391 average with 13 doubles, 13 home runs, a triple, and a team leading 66 RBIs. Sanders also collected 31 base on balls and was hit by pitches eight times while only striking out 21 at-bats. Sanders was been a main stay in the infield and middle of the order finishing with a career .393 average. Sanders was voted 2012 pre-season All-American, earned Region XI NJCAA honours and a NJCAA All-American Third Team selection. Sanders played for the Toronto Mets and coach Jason Chee-Aloy and earned 2011 Canadian Baseball Network Second Team honours. Second base: Rylan Chin (Strathmore, Alta.) Campbellsville. Chin went 3-for-4 as the Tigers blanked Virginia’s at Wise 10-0 in the Mid-South Conference tournament. He helped Campbellsville reach the NAIA Opening Round Tournament at Hunter Wright Stadium in Kingsport, Tenn. Chin doubled in a 9-3 win over Ashbury, he went 3-for-3 in an 8-4 win against Pikeville and had a pair of hits in a 12-4 win over Indiana SE. Chin hit .392 with nine doubles, two homers and 27 RBIs. He had a .497 slugging mark an .480 on-base percentage and a .977 OPS. Chin earned Mid-South Conference Second Team honours and he also made the academic team wih a 3.25 GPA on a 4.0 scale and being a sophomore or higher standing. Chin played for coaches Dave Robb then later Frank Ingram with the Okotoks Dawgs, earning 2011 Canadian Baseball Network Honourable Mention. Third base: Khifer O’Connor (Pembroke, Ont.) St. Lawrence. O’Connor doubled, singled and knocked in a pair of runs in a 10-7 win over RPI in the Liberty League tournament and he also knocked in the only run in the championship final, a 3-1 loss to Skidmore. He hit .390 with 16 doubles, three homers and led the Saints with 44 RBIs in 42 games. O’Connor helped the Saints to a 28-14 record on the way to winning Liberty League regular season for the first time in program history, as coach Peter Hoy was named Coach of the Year. O’Connor’s great uncle Shawn O’Connor was really great, a regular pitching at the nationals when picked up by Windsor after starring for the Ottawa-Nepean Canadians and he was part of the inaugural Nepean-Canadians Hall of Fame class. Khifer did collect a ringing single -- so loud it popped ear drums of those in attendance -- at the alumni game in a bid to be inducted into the next HOF class. O’Connor earned ECAC-Upstate Division III Conference honours and ABCA/Rawlings All Region Second Team recognition. He was a legacy with Don Campbell’s Ottawa-Nepean Canadians. Collins was 2-4 with a run batted in a 7-1 in a win over Mercyhurst North East, Collins had both Cougars hits in a 1-0 loss to the Monroe Tribunes and two-run hit in the nitecap, a 2-1 win. Collins went 2-for-3 for the Cougars in an 11-0 win over Monroe to clinch the No. 1 seed in the Region 3 tournament. Collins led the Cougars with a .421 batting average and 42 runs batted in during his freshman season. He tallied a team leading 51 base hits and hit a team high five homeruns in 121 plate appearances. Collins won the Region III First Team honours and the Coaches MVP award, receiving a plaque highlighting his accomplishment at the GCC award banquet. Collins played for Team Ontario for coaches Murray Marshall and Marc Picard. Outfielders: Emmanuel Forcier (St-Hyacinthe, Que.) New Mexico Jr. College, Peter Bako (Mississauga, Ont.) Southeastern Oklahoma State and Jon Mihic (Langley, BC) Kansas Wesleyan. Forcier’s best game was a four-hit effort in a 16-3 win against USW, as he tripled, hit two homers and knocked in three runs. He also had five three-hit games: knocking in a run in a 6-1 win over Luna, knocked in a run in a 5-4 win against Otero, homered and knocked in three runs in a 9-2 win against the Frank Phillips Plainsmen, four RBIs in a 9-1 win against the El Paso Tejanos and knocked in a run in a 10-8 loss to the Western Texas Westerners. Forcier for Sherbrooke for Mike Goyette, les Ailes in 2009, for Phil Tomlinson at College Lafleche in Trois-Rivieres and for pro scouts Alex Agostino and Ray Callari at the peewee level along with the likes of Louis Domingue, a draft pick of the Phoenix Coyotes and Mateo Agostino, now a provincial hockey referee and doing midget-AAA and junior Tier II, while studying engineering at university. Bako had a two-hit game as The Savage Storm fell 5-4 to Ouachita Baptist in an elimination game at the Great American Conference tournament. Bako had two hits in a 5-3 loss to East Central and two hits in the nitecap, a 6-0 win. He had a pair of hits in a 5-2 win against Southern Nazarene in his best outing since returning from a five-game lay off due to an injury. He is second on the team with a .336 average and has amassed 49 hits on the year with 10 doubles, a triple and four home runs. He drove in 21 runs and scored 31 and has stolen 17 bases on the season. He has a team-best .500 slugging percentage to go with a team-high .456 on base percentage for .956 OPS. He earned Great American Conference Second Team honours. Bako, who played for coach Danny Bleiwas and the Ontario Blue Jays, earned Canadian Baseball Network First Team honours in 2010 and Honourable Mention honours in 2009. Mihic singled, homered and knocked in three runs as the Coyotes beat Dakota Wesleyan 6-4. Mihic had three hits, including a pair of doubles, knocking in four runs including the game winner in a 13-12 win over the Tabor Bluejays. He knocked in a run in a 16-8 loss to Tabor in the opener of the KCAC Conference Tournament, doubled, singled and knocked in a run in a 5-4, 11-inning win over the Ottawa Braves in the, singled and drove in a run in a 10-2 win against Tabor and two hits and three RBIs as the Coyotes were eliminated 19-14. He hit .370 in 52 games with 15 doubles, two triples, five homers and 48 RBIs. He slugged at a .591 clip with a .457 on-base mark and a 1.048 OPS. Mihic, who played for Doug Mathieson’s Langley Blaze, earned Canadian Baseball Network Third Team honours in 2011. Barlow was 4-for-4 in the Chaps 4-1 win over the Western Texas Westerners and he had two hits in the nitecap, a 13-5 loss. He singled in a 5-4 win over the Colby Trojans, he knocked in three runs as Midland rallied from a 9-3 deficit to tie the score and win on his walk-off single in the 10th for a 11-10 win over the Howard Hawks and he hit a walk-off single in a 6-5 win over the Seward County Saints. Barlow hit .336 in 48 games with 15 doubles, two triples and 33 RBIs. He slugged at a .463 clip with an on-base mark of .425 for an OPS of .888. Barlow played for coach Doug Mathieson’s Langley Blaze program. Left-handers: Kyle Willard (Brampton, Ont.) Northeastern Oklahoma, Sean Callegari (Richmond, BC) Douglas. Voting (first-place votes in brackets): Otterman (13) 134, Hucul (12) 134, Zastryzny (21) 123, Lawrence (12) 92, Williard (0) 17, Callegari (0) 17. Right-handers: Adam Paulencu (Sherwood Park, Alta.) Embry-Riddle, Danny Britton-Foster (Ladysmith, BC), British Columbia, Milan Mantle (Langley, BC) Walters State, David LeBlanc (Quebec City, Que.) Lamar JC, Tim Black (Mount Hope, Ont.) North Iowa, Paul Barton (Qualicum Beach, BC) Panola, Anthony Ricciardi (Toronto, Ont.) Alabama State, Andrew Hyde (Etobicoke, Ont.) Notre Dame College, Justin Cook (Dresden, Ont.) Madonna, Devon Stewart (Maple Ridge, BC) Canisius, Billy Martin (Mississauga, Ont.) Canisius, Cashtyn DeLeeuw (Grimshaw, Alta.) Indian Hills, Cole Stober (Hays, Alta.) Minot State. Voting: Mortensen (34) 193, Van Spronson (5) 79, Ellis (7) 57, Paulencu (1) 33, Britton-Foster, (2) 21, Black (2) 20, Mantle (1) 18, LeBlanc (0) 16, Barton (2) 14, Ricciardi (2) 13, Hyde (1) 13, Cook (0) 10, Stewart (0) 10, Martin (0) 9, DeLeeuw (0) 7, Stober (1) 5. Relievers: Billy Hurley (Mississauga, Ont.) Wayne State, Ryan Noack (Hamilton, Ont.) Concordia-Ann Arbor, David Walkling (Nanaimo, BC) Penn State, Justin Davies (Hammond Plains, NS) Volunteer State, Dany Coulombe (Saint Leonard Que.) Northeastern Oklahoma, Conor Lillis-White (Toronto, Omt.) British Columbia, Nathan Linseman (Arris, Ont.) Canisius, Brian Bardis (St Constant, Que.) Chipola. Catchers Jordan Procyshen (Calgary, Alta.) Northeastern JC, Kelly Norris-Jones (Victoria, BC) Illinois, John Broll, Jr. (Mississauga, Ont.) Ashland, Jacob Hillier (Toronto, Ont.) Sauk Valley, Jeremy Kral (Prince George, BC) Douglas, Zachary Mihic (Langley, BC) Mayville State. Voting: Balkwill (16) 120, Patzalek (14) 120, Maoz (12) 91, Robinson (6) 71, Procyshen (4) 40, Norris-Jones (4) 43, Broll (0) 15, Hillier (1) 6, Kral (1) 6, Mihic 6. First base: Jeremie Fagnan (Calgary, Alta.) Midland, Scott Wilcox (Burlington, Ont.) Western Kentucky, Connor Panas (Toronto, Ont.) Canisius, Julien Casaubon (Joliette, Que.) Clarendon, Sean Mattson (Scarborough, Ont.) Bellevue. Voting: Friesen (21) 172, Marion (19) 132, Sanders (10) 117, Fagnan (5) 65, Wilcox (1) 15, Panas (0) 6, Casaubon (1) 5, Mattson (1) 5. 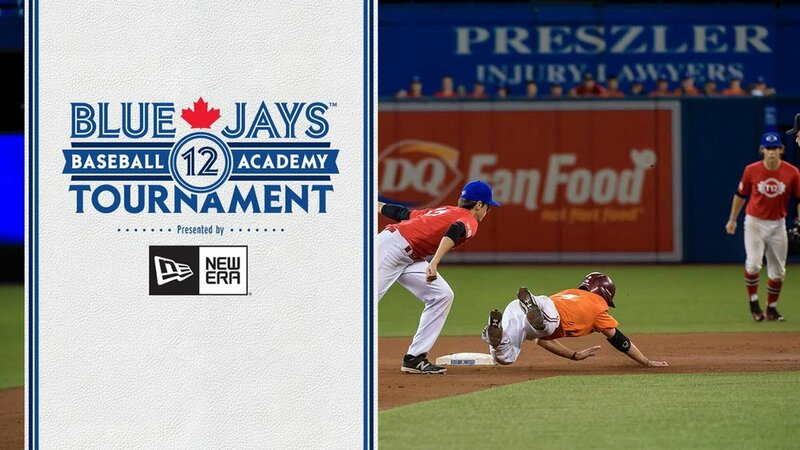 Second base: Troy Black (Mississauga, Ont.) Maine, Jon Cotter (Moose Jaw, Sask.) Central Missouri, Jag Gordaya (Victoria, BC) Texas Southern, Ryan Malhotra (Oakville, Ont.) Chicago State. Voting: Tissenbaum (40) 230, Jones (7) 80, Chin (6) 79, Black (1) 53, Cotter (2) 39, Gordaya (2) 11, Malhotra (0) 10. Third base: Tanner Morache (Surrey, BC) Southern Idaho, Drew Pettit (Fonthill, Ont.) Caniusis, Eric Wood (Toronto, Ont.) Blinn, Duncan Blades (Victoria, BC) Abilene Christian, Mattingly Romanin (Burlington, Ont.) Chicago State, Alex Baldock (Ottawa, Ont. ), Buffalo, Dominique Samyn (Quebec City, Que.) Northeastern Oklahoma, Chris Untereiner (Regina, Sask.) Long Island, David Head (Toronto, Ont.) Northestern Jr. College. Voting: Firth (26) 170, Calbick (8) 72, O’Connor (5) 48, Morache (2) 46, Pettit (3) 37, Wood (4) 34, Blades (2) 29, Romanin (3) 24, Baldock (1) 16, Samyn (0) 16, Untereiner (3) 15, Head (1) 5. Shortstop: Jon Neuberger (Weyburn, Sask.) Bluefield State, Phil Steer (Toronto, Ont.) Mayville State, Cedric Vallieres (Roxton Pond, Que.) 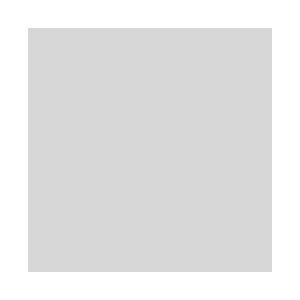 Clarendon, Matt Spillman (Welland, Ont.) UBC, Devin Ensing (London, Ont.) Kenyon, Phil Delisle (Repentigny, Que.) Nyack, Mitch Frey (Medicine Hat, Alta.) Henderson State. Voting: Dostaler (24) 150, Peragine (17) 122, Collins (5) 69, Neuberger (3) 57, Steer (1) 36, Vallieres (3) 28, Spillman (1) 20, Ensing (2) 13, Delisle (1) 11, Frey (1) 8. Outfielders: Kurtis McCallum (Thunder Bay, Ont.) Mayville State, Tyler Hibbert (Unionville, Ont.) Jefferson, Gabe Thibodeau (Laval, Que.) Central Missouri, Steven Adam (Tecumseh, Ont.) Salt Lake, Austin Voros (Surrey, BC) Texas A & M International, Kyle Turner (Rosser, Man.) Missouri Baptist, Dylan Lafrentz (Estevan, Sask.) Miles City, Phil Diedrick (Pickering, Ont.) Connors State, Cole Bauml (Marysburg, Sask.) Trinidad State, Nick Senior (Surrey, BC) UBC, Mitch Roy (St. Thomas, Ont.) Alderson-Broaddus, Aaron Palmer (Brampton, Ont.) Riverland, Josh Sigurdson (White Rock, BC) El Paso, Ryan Clarke (Mississauga, Ont.) Connors State, Sasha LaGarde (Pierrefonds, Que.) Chipola, Thomas Richards (Whitby, Ont.) Buffalo. Voting: Bignall (39) 221, Gooch (37) 203, Hollick (24) 148, Carruthers (5) 90, Russell (8) 84, Nivins (12) 81, Reichstein (6) 80, Forcier (4) 75, Bako (8) 69, Mihic (5) 67, McCallum (2) 50, Hibbert (2) 44, Thibodeau (4) 43, Adam (2) 35, Voros (4) 34, Turner (3) 32, Lafrentz (0) 25, Diedrick (1) 23, Bauml (1) 22, Senior (2) 20, Roy (1) 19, Palmer (1) 15, Sigurdson (0) 13, Clarke (0) 12, LaGarde (0) 12, Richards (1) 10. Voting: Edwards (35) 189, Alvernaz (14) 124, Barlow (2) 58, Stajduhar (4) 42, Zimmer (11) 38, Steven (2) 26, DiRoma (4) 18, Peters (0) 10, Lawrence (1) 5.